Intel revealed key details of its redesigned Atom microprocessor product line this morning. Code-named Silvermont, this all-new microarchitecture marks the first time that Intel will use its 22nm manufacturing process and 3D Tri-gate transistor technology to build a system-on-a-chip (SoC) platform for devices ranging from smartphones and tablets to microservers. Intel's next step with Atom will be to build the same basic microarchitecture using a 14nm manufacturing process. 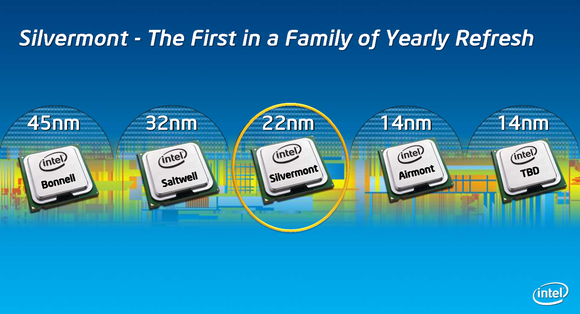 Intel’s current Atom line is based on the five-year-old Bonnell microarchitecture introduced back in 2008. Although Intel switched from a 45nm manufacturing process to a 32nm process in 2012, resulting in the current Saltwell platform, Saltwell is not fundamentally different from Bonnell. As a result of the age of their underlying architecture, Atom processors have not been competitive with mobile CPUs based on designs from the UK’s ARM Holdings. The Apple A series, Nvidia Tegra, Qualcomm Snapdragon, and Samsung Exynos mobile CPUs that power the vast majority of modern smartphones (and many non-Windows tablets) are all variations on one or another ARM platform. Silvermont will carry over several key technologies behind Intel's Core series of microprocessors designed for laptops and desktop PCs. Intel claims that will all change with Silvermont, and that Atom processors based on this new microarchitecture will deliver three times the performance while consuming five times less power (compared to its current-generation Atom cores, at least). “This is not just a tweak of Saltwell,” said Intel Fellow and chief architect Belli Kuttanna and at an embargoed press briefing last week, “it’s a fundamentally new design.” Kuttanna explained that many of the features present in Intel’s powerful Core series of desktop CPUs have been brought over to Silvermont, and that Silvermont SoCs will be available with up to eight CPU cores. Intel is making some big performance claims for its Silvermont microarchitecture, boasting three times the performance and five times less power than its current Atom line. Bay Trail: A low-power, quad-core SoC designed for tablets that will be available in time for the holiday shopping season. Intel also expects manufacturers to tap Bay Trail for "entry laptop and desktop computers in innovative form factors." Avoton: Designed for microservers. Available in the second half of 2013. Rangeley: Designed for infrastructure devices, such as routers, switches, and security appliances. Also available in the second half of 2013. Merrifield: A next-generation smartphone chip that Intel plans to ship by the end of 2013 for products hitting the market in the first quarter of 2014. An out-of-order execution pipeline is one of the key features that renders the Silvermont architecture superior to Bonnell and Saltwell. Those architectures must wait for input data to perform a program instruction. But Silvermont can skip ahead to whichever of the next instructions can be executed immediately, so the CPU should never sit idle with no workload to handle. 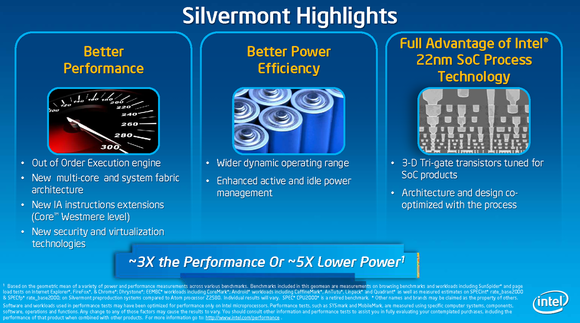 Silvermont will also deliver a number of new instructions aimed at delivering better security and higher performance, including support for 256-bit AES encryption and decryption, a new random number generator that can be used to render software more resistant to attack, new virtual machine functions that security software can tap, 47 new instructions for processes such as media acceleration and memory access, and seven new instructions for processing large data sets. Improvements to Silvermont’s burst mode also promise to deliver better performance. In existing Atom cores, the CPU can temporarily operate at a higher clock frequency (known as burst mode) only if there is thermal headroom. With Silvermont, burst frequency is managed in hardware and is based on thermal, electrical, and power-delivery constraints. What’s more, power can be shared among the core and other system components, such as an integrated graphics processor. Silvermont's power efficiency features promise to deliver better performance as well as longer battery life. If one core can handle the current workload, for instance, the second core can be put into a very low-power state and most of its electrical power can be shunted to the first core to enable it to operate at a higher frequency. By the same token, if both cores are needed, but the graphics processor isn’t, the GPU can be powered down so that the CPU cores can run faster. Silvermont also supports a dynamic burst mode where both the cores and the GPU can briefly run at higher frequencies (provided they don’t exceed thermal constraints). 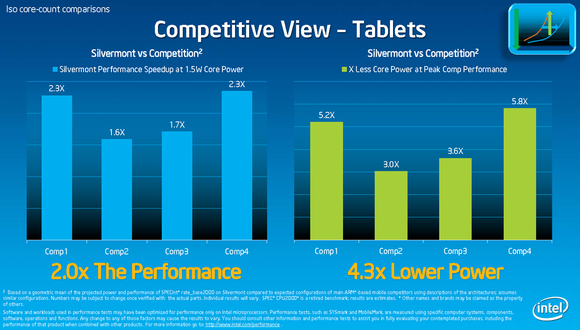 According to Intel, dual-core Silvermont-based Atom processors will outperform competitors' quad-core parts. This chart shows a dual-core Silvermont SoC performing on par with a competitor's quad-core part while consuming much less power. Comparing Silvermont to tablet SoCs from four unnamed competitors, Intel claims that its part will deliver twice the performance while consuming 4.3 times less power. 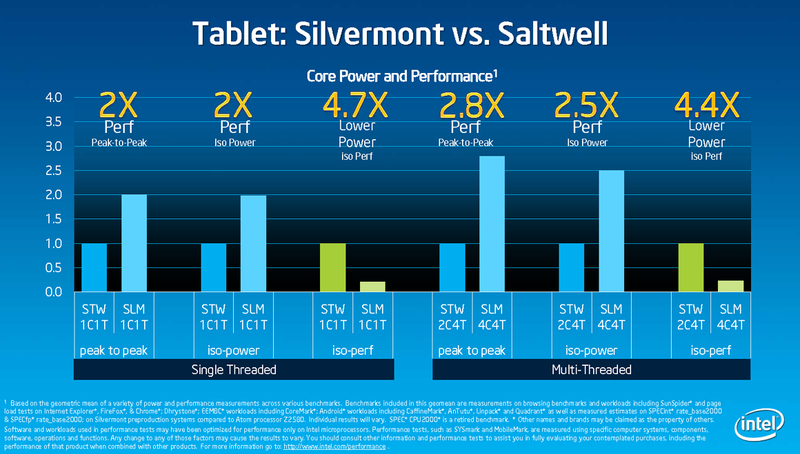 What’s more, Intel declared its dual-core Silvermont SoC to be superior to its (again, unnamed) competitors’ quad-core parts, delivering both higher performance and better power efficiency. We'll have to wait until the second half of 2013 to see if Intel can deliver on promises such as this. If Intel delivers on its promises, it could eventually come to dominate the market for smartphone and tablet CPUs in the same fashion that it rules the PC market. The fact that Intel owns its own fabrication facilities and the intellectual property for manufacturing 3D transistors will certainly help. But the company must first deliver the goods and then convince device manufacturers to use them. The competition, meanwhile, isn’t going to stand still and wait for Intel to catch up. Updated on May 7 with an IDG News Service video report.